Isaac-Renton M, Stoehr M (In Prep) Can we maintain wood quality of improved trees through silviculture? Since faster tree growth can be associated with lower wood strength and stiffness, selecting trees for volume gain in tree improvement programs may inadvertently lead to reduced wood quality. Here, we characterize growth, stem quality and wood quality in genetically superior trees of coastal Douglas-fir (Pseudotsuga menziesii var. menziesii), a timber species prized for high wood quality. We set out to determine: 1) If the predicted level of stand productivity of genetically improved Douglas-fir is realized under the competitive relationship of different planting densities, 2) if superior crosses show declines in wood and stem quality relative to unimproved controls, and, if so, 3) whether silvicultural prescriptions involving higher planting densities can offset quality losses. Working in 20-year realized gain trial, we measured multiple traits on three levels of expected growth gains tested under four planting densities with two replicates on 5 sites. Results show that volume gains of improved seed sources exceed predictions derived from progeny trials. Improved trees also showed slightly better stem quality through reduced canopy size. Wood density and microfibril angle proxy measures indicated that denser initial planting densities produces better wood quality in improved trees. Nevertheless, relative to a wild-stand control, the improved trees showed reduction in microfibril angle and wood density. While large volume gains can be achieved through genetic selection, reductions in wood quality can be minimized under higher operational planting densities. These results suggest that it may be possible to maximize growth and wood quality. Preliminary results were presented through the Canadian Wood Fibre Centre's Contribution Agreement Program. Click here to download. In this study, we show that physiological adaptations to drought vary greatly within a wide-spread forest tree species, which considerably limits the application of climate change adaptation strategies such as assisted migration. Working within the experimental structure of a 30-year genetic field trial, we analyze relative contributions of xylem plasticity and inferred stomatal response to drought tolerance in populations from across the entire lodgepole pine species distribution (Yukon to Colorado). We show the range of isohydric to anisohydric behaviours within a species due to population-level genetic adaptation. Results also show northern forests are at-risk to drought due to physiological maladaptations, contradicting predictions that they will benefit from warming. Meanwhile, populations from central parts of the species range are plastic and not in urgent need of assisted migration, contradicting model predictions. Assisted migration to central forests may also involves risks – a note of caution as climate-based seed-transfer programs begin to unfold. 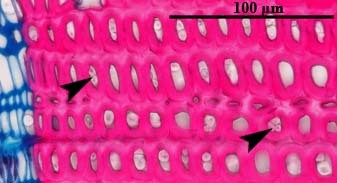 Cross-section of a pine needle; 2 sunken stomatal openings clearly visible. Stomata regulate water loss and carbon uptake by opening/closing under different conditions. Under stress, this also changes the proportions of isotopes taken up by the tree: this stress signal is archived in tree rings. Poster showing project results, presented at the 11th North American Forest Ecology Workshop in Edmonton, Alberta from June 19 - 22, 2017 (12 MB; opens a new window). Poster showing pilot study results indicating the most suitable material for study, presented at "Science Day" at the Swiss Federal Institute for Forest, Snow and Landscape Research in July 2015 (13.5 MB; opens a new window). ​With lengthening growing seasons but increased temperature variability under climate change, frost damage to plants may remain a risk and could be exacerbated by planting warm-adapted seed sources (assisted migration). Here, we study cold adaptation of tree populations in a wide-ranging coniferous species in western North America to inform limits to seed transfer. Using tree-ring signatures of cold damage in common garden trials designed to study genetic population differentiation, we find opposing geographic clines for spring frost and fall frost damage. Provenances from northern regions are sensitive to false springs, while the more productive provenances from central and southern regions are more susceptible to fall frosts. Transferring the southern, warm-adapted genotypes northward causes a significant loss of growth and a permanent rank change after a spring frost event. We conclude that cold adaptation should remain an important consideration when implementing seed transfers designed to mitigate harmful effects of climate change. A stained micro-section of wood showing a tree-ring boundary affected by a blue ring (lack of lignification) and a frost ring (cambial damage). Amoroso M, Speer J, Daniels L, Villalba R, Cook E, Stahle D, Srur A, Tardif J, Conciatori F, Aciar E, Arco J, Bonadas A, Coulthard B, Haney J, Isaac-Renton M, Magalhaes J, Marcotti E, Meglioli P, Sol Montepeluso M, Oelkers R, Pearl J, Garcia MP, Robson J, Rodriguez Caton M, Soto P, Young A. (2018) South American Dendroecological Fieldweek 2016: Exploring dendrochronological research in Northern Patagonia. Tree-Ring Research 74 (1): 120-131. This is a report from the South American Dendroecological Fieldweek (SADEF), which was associated with the Third American Dendrochronology Conference, and held in El Bolsón, Argentina, in March 2016. After developing an Austrocedrus chilensis chronology from 1629–2015, we found a persistent decline in growth since 1977 which supports the fact that the current severe drought is the most severe in the 386-year record. This unprecedented aridity trend in northern Patagonia shows the scope of forest management challenges expected under climate change. Isaac-Renton M, Treydte K, Schneider L (2016) Contamination risk of stable isotope samples during milling. Rapid Communications in Mass Spectrometry, 30(13):1513-1522. Isotope analysis of wood and cellulose is an important tool in dendrochronology and ecophysiology. Prior to mass spectrometry, wood must be homogenized, and a convenient method is to use a ball mill. However, sample-tube plastic can contaminate wood during milling. While oxygen isotope measurements were unaffected, we found a strong risk exists for carbon isotope bias through plastic contamination. We could also identify a possible risk for contamination from small fibers from the Teflon filter bags used during cellulose extraction. Choosing an inert container or other method of homogenization is therefore imperative to prevent biological misinterpretations. There remains a need for a homogenization method that is both fast and contamination-free. Tubes on the right were milled for longer, showing more plastic abrasion. Since plastic is fossil-fuel derived, it carries it's own carbon isotope signature that taints the signal from wood. ​Montwé D, Isaac-Renton M, Hamann A, Spiecker H (2016) Drought tolerance and growth in populations of a wide-ranging tree species indicate climate change risks for the boreal north. Global Change Biology, 22(2):806-815. ​Choosing drought-tolerant planting stock in reforestation programs may help adapt forests to climate change. To infer potential benefits of a northward transfer of seeds from drier, southern environments, we analyzed growth responses of lodgepole pine populations to drought and warming in a provenance trial. Growth after 32 years indicated that provenances transferred southward or northward over long distances was significantly lower than growth of local populations. The provenances from the most southern locations showed the highest drought tolerance but low productivity. Local provenances were productive and drought tolerant. Provenances from the boreal north showed lower productivity and less drought tolerance on southern test sites than all other sources, implying that maladaptation to drought may prevent boreal populations from taking full advantage of more favorable growing conditions under projected climate change. 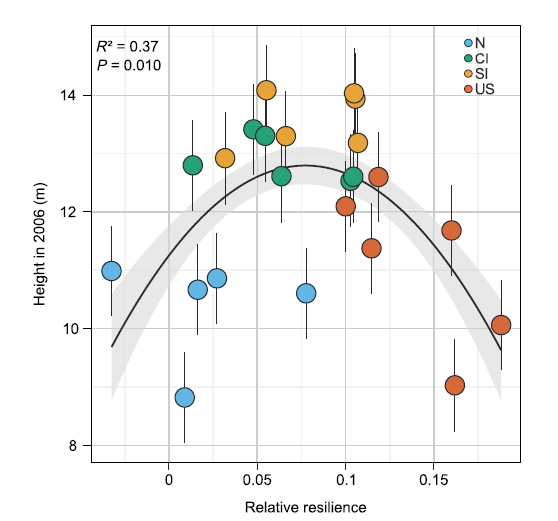 Trade-off between height and drought tolerance (relative resilience according to Lloret et al 2011). Data points represent provenances colored by climatic region. ​​Montwé D, Isaac-Renton M, Hamann A, Spiecker H (2015) Using steam to reduce artifacts in micro sections prepared with corn starch. Dendrochronologia, 35:87-90. 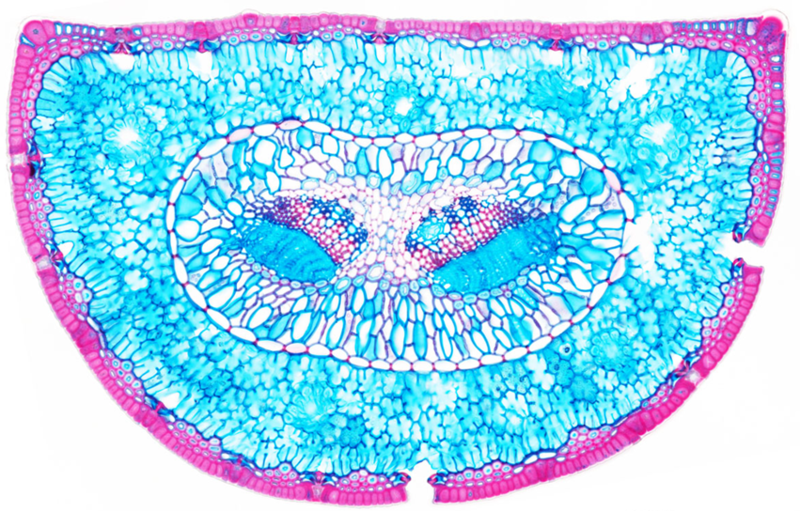 Several important signals can be interpreted from the cellular structure of tree ring cells. To measure these parameters, preparing micro sections of wood has become commonplace in some fields. Previously, the pressure of cutting with the microtome blade led to cellular damage. A recent improvement involves applying a corn-starch solution prior to cutting. This non-Newtonian fluid hardens under pressure and protects the cell structure during cutting, and yet can flow out afterward. We found thorough rinsing afterward to be ineffective at fully removing starch granules, however. Remaining granules in the cells lead to image artifacts that significantly slow the process of image analysis. Here, we present a simple and fast solution: steaming micro sections for one minute to gelatinize the remaining starch granules allows them to be more easily rinsed away. This method facilitates efficient sample preparation and image analysis for studies with long samples sizes or time series. Microsection of wood stained with Astrablue and Safranin, resulting in the cell walls being dyed pink. The arrows point out remaining starch granules, which create problems during image analysis that can be time consuming to fix. Isaac-Renton M, Roberts DR, Hamann A, Spiecker H (2014) Douglas-fir plantations in Europe: a retrospective test of assisted migration to address climate change. Global Change Biology, 20:2607-2617. We applied North American species distribution models to the European context to determine the most suitable seed sources for planting under climate change. The model was trained on over 50,000 forest inventory plots in North America and validated with growth data from 700 North American provenances tested at 120 European planting sites. The model was found to be well suited for predictions in western and central Europe, but failed to predict the success of the coastal variety in eastern Europe. 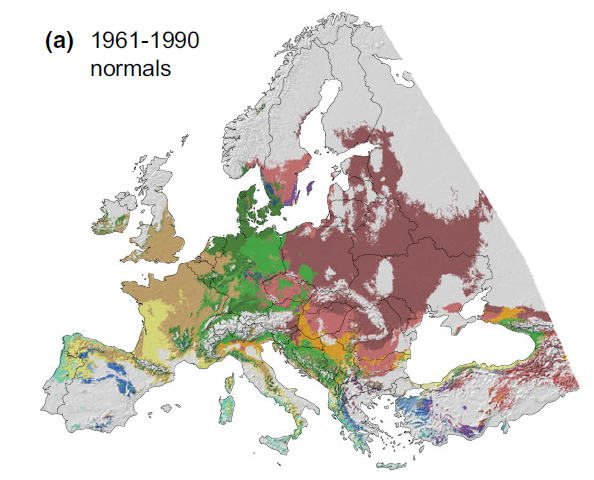 Results indicated that observed climate trends over the last three decades appear to warrant changes to current use of Douglas-fir provenances for planting in western and central Europe. The results of this paper will help forest practitioners across the continent develop climate change adaptation strategies in their local regions for one of Europe’s most important tree species. Additionally, this work represents a novel methodology for gaining confidence in projected habitat by validating the species distribution models with observed growth in genetic provenance trials. This is methodology can also have widespread applicability, because models can be validated for important tree species around the world. Poster showing project overview (18 MB; opens a new window). Species distribution model for Douglas-fir populations. It was trained using North American data and applied to Europe after validation with growth data from provenance trials. Isaac-Renton M, Bennett JR, Best RJ, Arcese P (2010) Effects of introduced Canada geese on native plant communities of the southern Gulf Islands, British Columbia. Écoscience, 17(4):394-399. We investigated whether an introduced race of Canada geese (Branta canadensis) could be facilitating the invasion of exotic annual grasses in some of the most biologically diverse and threatened ecosystems in Canada. At the plot level, our results were consistent with our working hypothesis that they increase exotic cover at the expense of native species, but, unexpectedly, opposite trends were seen at the scale of whole islands. This could potentially reflect a lag effect since this non-migratory race was introduced only relatively recently. This paper helps to change widespread public perception that the geese are native to the region and that there may be time for managers to help reduce biodiversity loss. Isaac-Renton, M (2017) ​Tree population responses to extreme climate events to guide reforestation under climate change. PhD Thesis. University of Alberta. Isaac-Renton, M (2013) Guiding Douglas-fir seed selection in Europe under changing climates: bioclimatic envelope model predictions versus growth observed in provenance trials. MSc Thesis. University of Alberta.